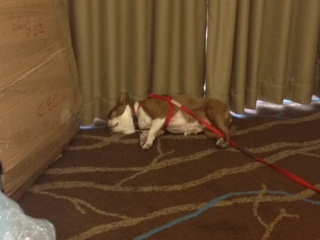 For more photos from BlogPaws, check out our Facebook album. Oh my golly gosh , I could just go for a chase. I love seeing everyones pictures. It was great meeting you there!! Stopping by from the blog hop. We were there too! I was the human there with Kendall, a Cavalier King Charles Spaniel. What a fun time! Those are some great pictures. I especially love the picture of the 2 ferrets in the backpack. It reminds me of an old movie I saw long ago…Beastmaster…anyone else see it? So cute and sweet. Happy WW!! !